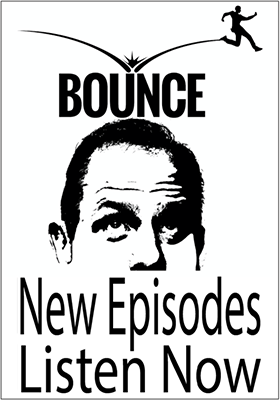 For iPhone/iPad/iPod listeners – Grab your phone or device and go to the iTunes store and search “The Bounce Podcast” This will help you to download the free Podcasts App (produced by Apple) and then subscribe to the show from within that app. Every time I produce a new episode, you’ll get it downloaded right on your iDevice. For Android listeners – Download the Stitcher Radio app (free) and search for “Bounce Podcast.” Or, if you have already downloaded a podcasting client, follow the directions in the next sentence. For those who don’t have a mobile device – You can always listen to the show by clicking the audio file at the top of the podcast show notes (under the image) of this page. All new shows and archives here larryweeks.com/podcasts.